Please click on any of the categories to learn more about the PRODUCTS generated by members of the SFI Lab and its partners, including publications, presentations to outside organizations, and other contributions to the state of the art in built environment sustainability. 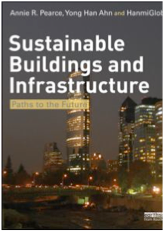 Two of SFI Lab’s core members, Dr. Annie Pearce and Dr. Yong Han Ahn, have recently partnered with international firm HPGlobal and Earthscan Publications to produce a book that addresses sustainability in the built environment throughout its life cycle and across all construction activities. It is aimed at students taking courses in Construction Management and the Built Environment. Written in a lively and engaging style, the book sets out the practical requirements of making the transition to a sustainable construction industry by 2020. Case studies are included throughout, making the book both a core reference and a practical guide. To order the book or request a complimentary exam copy, visit Earthscan’s web site. The findings of SFI graduate Jake Tucker’s study on the self-perceived value of broad-spectrum green professional credentials in the construction industry are now available by request. The paper is currently under review for publication. To request a copy of the full study, contact Jake at jrtucker@vt.edu.